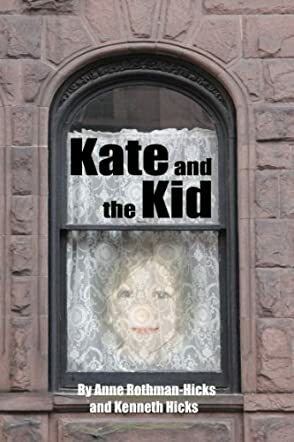 Things are looking bleak for both Kate and "the kid" at the start of Anne Rothman-Hicks and Kenneth Hicks' novel, Kate and the Kid. Kate lost her editorial job at a NYC publishing company and had a huge, possibly relationship ending, fight with her lawyer boyfriend. The kid, Jenny, fell asleep one night with her mother and awoke the next morning to find she'd been abandoned and left to stay with her mom's friend, Sally, who refers to Jenny only as "creep-head." Jenny's previous six years likely hadn't been much better since she's so scared and shy that she only speaks through her one armed Barbie named Miranda. Both girls desperately need a break and a friend when they are thrust together. Despite her lack of motherly instincts and her issues with her own mother, Kate connects quickly with Jenny. Kate seems to understand Jenny and treats her like a real person instead of some annoying burden. Jenny latches onto her and the two end up spending more and more time together while Kate unwillingly takes on more and more parental responsibility. As Kate tries to reconnect Jenny with her mother, she ends up getting seriously involved in a world she knows nothing about. A world of drug dealers, attempted murder, and family court. Through everything, Kate wants only to help Jenny and do what is best for the sweet little girl. But with so many factors involved, from Jenny's mother to her alleged father to social workers, Kate has a big challenge ahead. Warning: reading Kate and the Kid might cause you to lose all track of time and anything going on around you. This novel was completely engrossing. Anne Rothman-Hicks and Kenneth Hicks created characters who were completely relatable but still surprising. I loved Kate and Jenny and really wanted everything to work out for both of them - to the point that they were on my mind even when I wasn't reading the book. Kate's boyfriend, Jenny's mother, Sally and the rest of the characters were so well developed, I felt like I knew them. Even Kate's mother, who we never meet, felt real to me. The descriptions of all the NYC parks, playgrounds and other places Kate and Jenny visited were vivid and beautiful. There are stretches of the novel when everything was going great and I ended up totally stressed out wondering when and what would happen to interrupt the bliss. This is one of those books that you don't want to ever end! Kate and the Kid, written by the husband and wife team of Anne Rothman Hicks and Kenneth Hicks, places you in the heart of New York City. One of the city’s oldest publishing firms shuts down, leaving Kate unemployed. Maybe it’s time to write one of those books she has buried within? After all, she is supposed to be a famous writer by now. Forgetting her keys, after having an argument with her boyfriend, Kate is locked out of her apartment building. Looking through the front door, she spots a little girl with a dirty face staring out into space. Kate tries to get her to open the door, but the little girl runs away. This brief encounter changes Kate’s life in ways she never could have imagined. Before long, little Jenny captures Kate’s heart and they become inseparable. Both Kate and Jenny discover there is a whole new world waiting for them. However, their happiness is challenged. Danger lurks, and even comes to visit. Just how much is Kate willing to risk for Jenny? Possibly, everything. Kate and the Kid is a compelling story about child abuse. The Hicks team writes a realistic narrative proving one person can make a difference. Although Kate’s character is conflicted, she is strong-willed, smart and courageous. Her character arcs and ultimately evolves due to her sidekick, Jenny, (the real heroine of the story). As the story unfolds, little Jenny’s character dramatically begins to change. The walls built around her innocence melt like wax. In the beginning, the mood is desperate. Life is full of uncertainty, disappointment, and the streets of New York City reek of crime and danger. Yet, just when things couldn’t get any worst, hope springs up. These authors are a dynamic duo. Kate and the Kid breaks your heart, then ignites a fervent flame of determination to read through to the end. Emotionally hooked into the plot, I could not stop reading. Captivated, I had to know the outcome. I was not let down. The ending feels like a warm blanket on a cold and bitter winter’s day ... so good. Kate And The Kid by Anne Rothman-Hicks and Kenneth Hicks revolves around a troubled woman, Kate, and a neglected child, Jenny. The latter has been physically and mentally abused by her alcoholic and drug addict mother who still continues to live her life in the same lane. Kate has enough issues in her life. Hiroth Publishing, where she has been working, is closing down and she has two weeks left to find another job. It is at this stage of mild depression when Kate sees the six-year-old looking out of Mrs Morley's street level apartment one day. Kate takes this little girl under her wing and tries to give her a normal life by making her feel loved and giving her the simple joys of being a little girl. The plot is relatable with its authenticity in character portrayal and dialogue. The book handles the topic of child abuse very well and shows readers how a person can bring about a positive change in another person's life. The book connects with readers emotionally, and every scene in the book, from the parks to the courtrooms, to the cheap apartments and hospitals is described with expertise. The book has a subtle message which makes the story even more appealing. The author weaves the story of Jenny and Kate together while the other dominant characters in the story, Sally and Roger, are also well sketched, aiding the main characters effectively. This beautiful story of bonding, friendship and loyalty is a touching read.